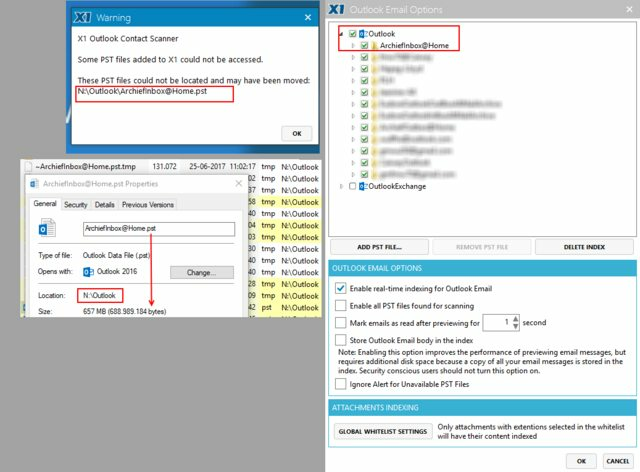 Some PST files added to X1 could not be accessed. However, there is nothing wrong with the .pst file. b. it is also tagged in X1 settings. Never saw this in the previous version. I might simply start re-indexing, there will be -no- error. It simply pops up once or twice, though X1 is working fine as far as I can see. I have seen that, but it is transient. The PST files connects later. Sometimes it seems to be related to other things going on on the PC, like a backup program locking the file. As info: I did submit a 'case' to X1 support. They asked me to send over the diagnostics report. This I didn't: so much personal data is transmitted, frankly, I feel a little uncomfortable to do so. Informed them accordingly and decided to let it rest and accept the error. Maybe, at one point in time, they will find a fix anyhow. Yes, we do read this forum regularly. There have been many reports of this message popping up recently (indeed, in the last couple of weeks). We have reason to believe that it may be related to a recent Windows update. I myself have been affected by this particular issue. It seems to be fairly harmless (as Kenward says, the affected PST reconnects and is searchable) but like all of you I dislike having error messages for "no" reason. Rest assured, we're looking into it - but as always, any additional info that you'd like to provide certainly can't hurt. 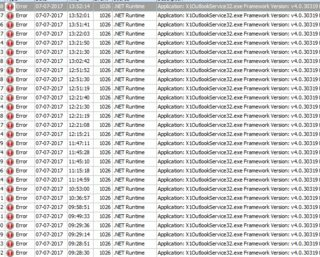 Do you by chance have .NET4.7 installed? 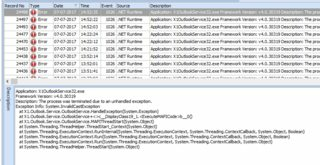 We've seen reports of strange bugs with Windows 7 and .NET 4.7.
as well as the latest .NET Framework version. "Something went wrong and your search couldn't be completed"
I get the same error, now : "These PST ﬁles could not be located and may have been moved" with Windows 10 64 bits (with all the latest updates) / X1 Search 8.5.2 60015i (64—bit) / BitDefender. Of course, Outlook works, my PST file is here and didn't move. And currently X1 never reconnects to the lost PST file until I reboot. I have tried to uninstall completely X1 and reinstall it. Same random punishment. I also frequently lose the connection with the X1 service. Any progress in the search of the reason of this boring bug ? X1 is currently no more reliable. Identical Issue. 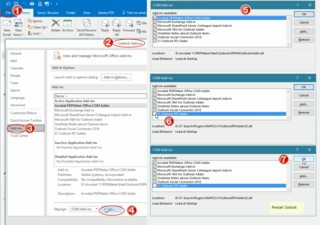 Can duplicate on second win 10 machines on 17035 and 17025.